What do you understand by the term Microsoft Foundation Class (MFC)? A set of functions, constants, data types and classes which are meant for simplifying the process of applications creation for Microsoft Windows operating system are known as Microsoft Foundation Class (MFC) library. This tutorial throws light on starting and creation of the windows-based applications using MFC. Who are the audience for learning the concept of MFC? This tutorial is mainly targeted for the software developers who desire to develop best-in-class applications using the concept of MFC. By this tutorial one can easily understand the concept of MFC, as the tutorial explains with step-by-step examples, illustrations, source codes etc thus enabling the developers to learn and put the concept into practice. What are the prerequisites required for learning MFC? 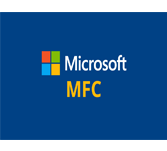 Good knowledge and understanding of Windows programming is essential for understanding the concept of MFC. Also knowledge and understanding of the concept of c++ programming and fundaments of object-oriented programming enables to better understand the concept of MFC.